The prices of global depository receipt (GDR) or American depository receipt (ADR) of Indian companies has shown an upward trend in a year. This is reflected in Instanex Skindia DR Index. The index increased by 13.2% to 3,115.88 on January 11, 2011, against 2,752.21 on January 4, 2010. Sharp rise in price of ADRs/GDRs has pushed the index upward. The P/E ratio of the index increased from 23.81 to 26.67. Among the 15 companies, highest increase in P/E was seen in Dr Reddy's followed by Tata Motors. Sensex increased by 9.3% to 19,196.34 against 17,558.73 while Nifty surged 9.9% to 5754.10, during the period under review. Out of 15 companies, eight companies GDR/ADR prices increased during the review period. Grasim Industries, ITC, M&M, Reliance Industries, Satyam Computers, Sterlite Industries and Tata Communications saw decline in the ADR/GDR prices. Tata Motors ADR price surged by 47.9% since January 4, 2010 to January 11, 2011. Dr Reddys ADR price rose 48.1% (46.4% in domestic market ) to $36.85 and SBI surged 16.8% (13.9%) to $116.25. L&T's GDR price increased by 7% (5.6%). GAILs GDR soared 23.1% (20.5%) to $66.45 and Ranbaxy Labs GDR increased 15.6% (8.9%) to $12.6. ADR prices of Infosys increased 32.5% ( 27.3%) to $75.20. However, Grasim Industries GDR price declined 6.8% to $51.26, ITC GDR price plunged 31.4% to $3.76, M&M GDR dipped 32.9% to $16.24, Reliance Industries GDR price down 3.9% to $45.38, Satyam Computer ADR fell 33.9% to $3.17, Sterlite Industries ADR slipped 19.8% to $15.51 and Tata Communications ADR price slide 22.1% to $11.61. Though ADRs have hogged most of the limelight there are more GDRs than ADRs in the overseas market. 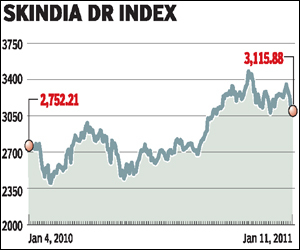 The Skindia GDR Index, an index tracking GDR/ADR prices, list 8 Indian ADRs and seven GDRs. Instanex Skindia DR Index saw fluctuatation during the period under review but by the end of the year managed to end in green. The premium, which was 1.24% on January 4, 2010, increased to 2.72% on January 11, 2011, mainly due to strong international markets. Satyam Computer saw its ADR premium widen considerably during 2010. Its ADR traded at a premium of 11.06% on January 4 compared to 7.47% on January 11, 2011. Similarly Tata Motors saw its ADR premium widen considerably during the study period. Tata Motors ADR traded at a premium of 0.47% on January 4, 2010, as compared to 5.82% on January 11, 2011. However, Ranbaxy Labs GDR, which traded at a discount of -2.29% on January 4, 2010, turned out to be premium of 3.07% on on January 11, 2011.